Pan fried gnocchi are soft and fluffy on the inside and crispy and delicious on the outside. These delicious little bites are incredibly easy to make and make a great quick side dish, appetizer or snack. Simply fried with salt, pepper, rosemary and so easy to adapt. The easiest alternative to fries or roast potatoes..
Did you know you CAN fry gnocchi straight out of the bag? Oh yes, you don’t always have to boil them and toss them with a sauce. You can pan fry them to crispy, soft centred delicious little bites that make a great alternative to fries or roasted potatoes which can take the best part of 40 minutes to 1 hour to prepare. 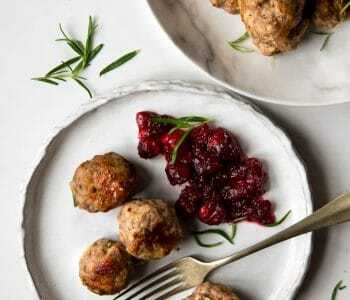 These little beauties, however, are ready from start to finish in only 8 minutes! Yup, I’ve been making fried gnocchi this way for years now and I LOVE them. Why not try making your fried gnocchi into an appetizer? Fried gnocchi, pecorino and prosciutto skewers. 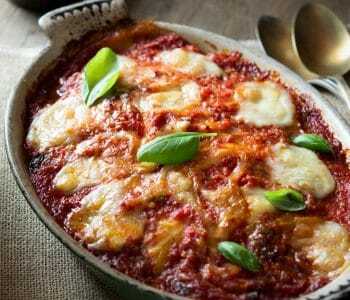 I usually serve them as a side dish to go with steak and my favourite parmesan cream sauce. Which btw is one of my favourite meals of all time! Do I Need To Boil Gnocchi First Before Frying? The simple answer is NO. I’ve tried it this way a few times but it makes no difference to the cooking time (it actually takes longer because you have to boil them first) or the taste or quality. Simply toss them straight from the bag into a pan and fry. Heat 1 tablespoon of olive oil in a large frying pan. Add the fresh gnocchi and toss so they are covered in the oil and add the rosemary. Fry the gnocchi tossing every now and then so they get crispy on all sides for around 8-10 minutes. Tip: The gnocchi should be just crispy on the outside. Don’t fry them for too long or the centre will firm up on you’ll lose the soft, fluffy centre. Once the gnocchi are crispy on all sides, season them with a good pinch of salt and pepper. Serve them as a side for dinner or as an appetizer with dips. If you’ve tried this pan fried gnocchi recipe this or any other recipe on the blog then don’t forget to rate the recipe and let me know how you got on in the comments below, I love hearing from you! You can also FOLLOW ME on FACEBOOK, TWITTER, INSTAGRAM and PINTEREST to see more delicious food and what I’m getting up to. Pan fried gnocchi are soft and fluffy on the inside and crispy and delicious on the outside. These delicious little bites are incredibly easy to make and make a great quick side dish, appetizer or snack. Heat 1 tablespoon of olive oil in a large frying pan. Add the fresh gnocchi and toss so they are coated in the oil, add the rosemary. *Store bought gnocchi are found in the refrigerated pasta section. Not to be confused with the dried pasta gnocchi variety. The gnocchi should be just crispy on the outside. Don't fry them for too long or the centre will firm up on you'll lose the soft, fluffy centre. 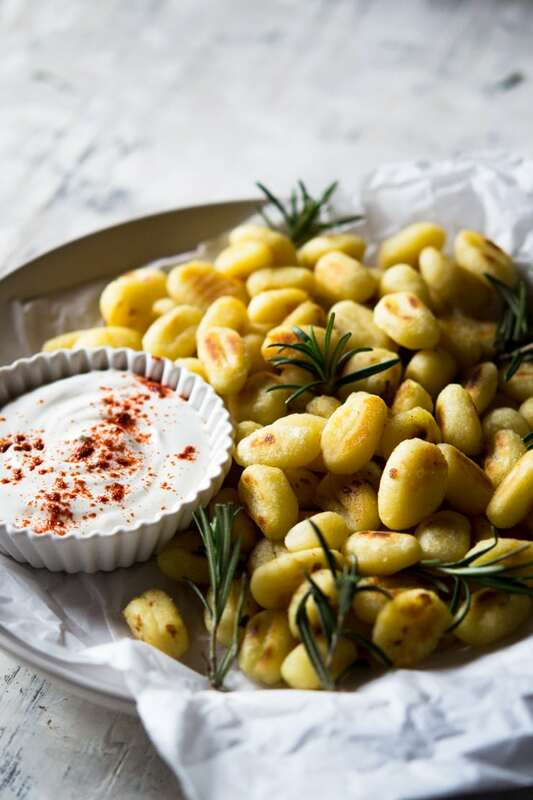 Emily – You mention using these fried gnocchi as an appetizer, serving with dips. 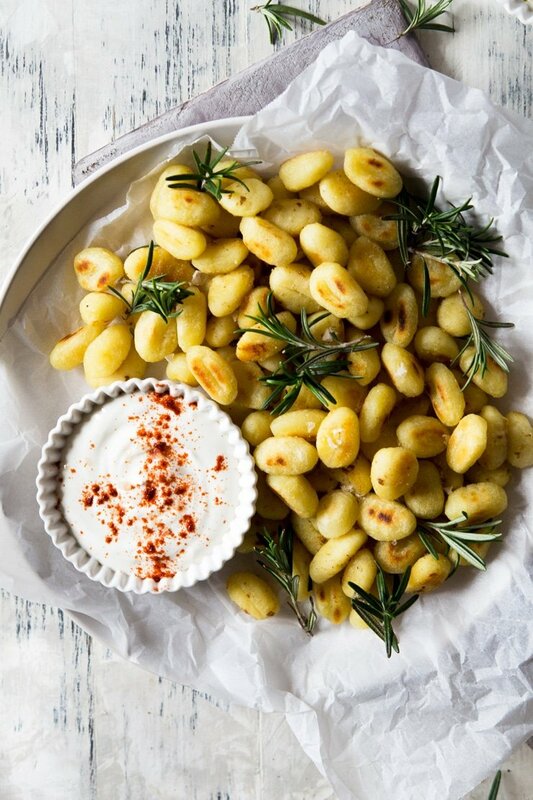 Do you have any dip recipes you would recommend that would go nicely with this pan fried gnocchi recipe? Hi Debi, sure this pesto dip would go really well and is one of my favourites (homemade pesto mixed with a little sour cream) and also this taleggio white bean dip would be great! Serve with cocktail sticks so they’re easy to pick up. Hope you enjoy! Mmm!! Quietly drooling on the bus home from work while reading this recipe and all the delicious suggestions on how to have them!! Think I just changed my dinner plans! easy to make?.. no not easy to make as you have to use boiled potatoes and mix with semolina and/or other stuff that takes ages and is really fiddly although wonderful results.. this recipe is for gnocchi already made!! Hi Dina, yes that is correct this recipe is for store bought, pre-made gnocchi that’s why I refer to frying the gnocchi straight from the bag/packet. 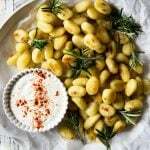 I’ve listed fresh gnocchi in the ingredients referring to the gnocchi found in the refrigerated pasta section of supermarkets instead of the dried pasta kind which is also found in supermarkets in Italy. I’ve added an extra note in the printable recipe card so there is no further confusion. Thanks! This sounds like heaven to me! I love that this pan fried and not in a sauce. YUM! 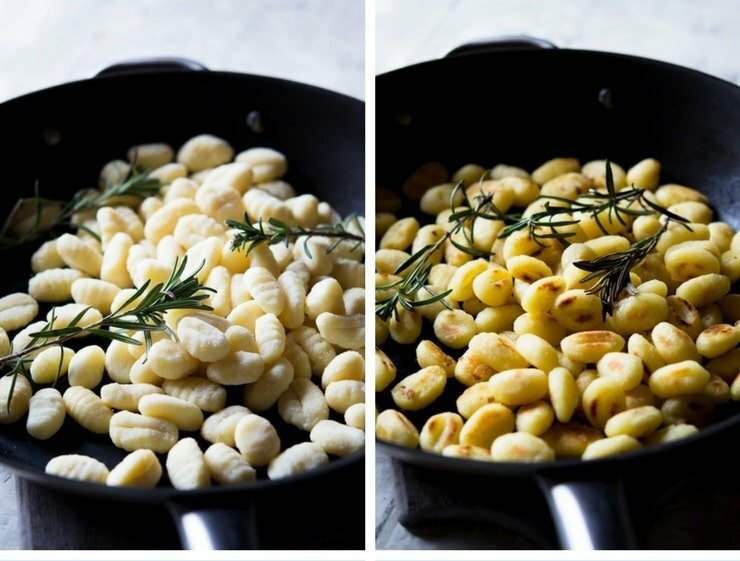 Simple and delicious flavors with fresh Gnocchi and rosemary. Such perfection! 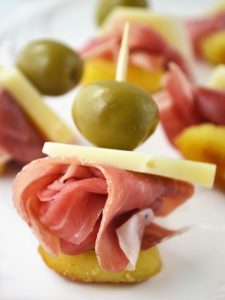 What an easy yet elegant food, I bet this would be perfect for a get together! I love gnocchi and always forget how easy they are to put together and go with almost any sauce! They do make an impressive appetizer or starter too. Lightly crisp on the outside, so delicious! I love gnocchi prepared in any form, but these crispy edges are really giving me all the side dish envy right now. I absolutely need to add these to my “make that” list. Pinning too!